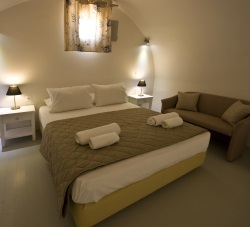 Alafouzos Studios welcomes	holidaymakers to sunny Santorini.. The Complex has 7 Apartments (sea view or inland view). 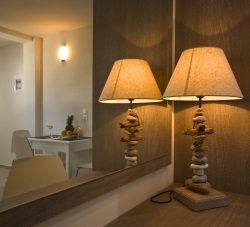 Standard room features include a bathroom, private balcony, music, direct dial phone, fridge, A/C and SAT TV. Room Types include 2 Single Rooms / 20 Twin Rooms / 4 Triple Rooms / The Honeymoon Suite. Enjoy drinks in a romantic atmosphere on your balcony and relax to the sound of the waves. Opening to a patio with pool views, this studio includes air conditioning, free WiFi and a kitchenette with cooking hobs and a fridge. Opening to a patio with side sea views, this split-level studio includes air conditioning, free WiFi and a kitchenette with cooking hobs and a fridge. Opening to a patio with pool views, this split-level studio includes air conditioning, free WiFi and a kitchenette with cooking hobs and a fridge.